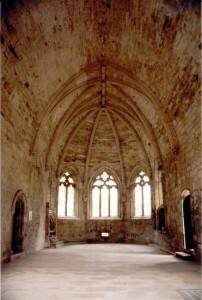 Just like Rosslyn Chapel Seton Collegiate Church is oriented east to west. That is the Choir is in the east and the Nave in the west. This is the most common directional arrangement of Christian buildings the site and other factors permitting. Seaton Collegiate Church is more complete than Rosslyn Chapel as succeeding generations of the Seaton family added to and improved the building. Yet one suspects that the family never got round to adding was any significant amount of interior decoration. What little was included is intriguing especially as some of it, like the carving of the head of a murdered apprentice, has echoes of Rosslyn. On the left nearest the windows is a tomb recess but unfortunately it is not known for which members of the Seton it was made. The effigies, of a knight and a lady, are in a style which dates from the early 15th century. The choir is roofed by a fine and typically Scottish barrel vault. The rib vaulting of the choir is of excellent quality and workmanship.